चे को सलाम और आपको भी.इतनी महत्वपूर्ण जानकारी,इतने सरल अंदाज़ में .हम तो इस शेली के कायल हैं.बधाई. हो ही नहीं सकता कि कोई पूरे पौरुष के साथ तन कर आसमाँ और धरा दोनों से टकराने के लिए खड़ा हो और उसकी ओर चाहत भरी नजरें न हों ! चे की याद दिलाने के लिए धन्यवाद। 'बोलिविया की डायरी' पढ़ने के बाद तो मैं . . .
चे तो अपने भी आइडियल है.. क्यों है ये तो पता नहीं.. There is a famous film based on his travel accounts 'Motorcycle Diaries'. Those who don't want to see India on motorcycle should stay away from discussing him. Motorcycle was central to his persona and in India ppl dont know it. मोटरसाइकिल, हमें चलानी नहीं आती और न ही आकर्षित करती है तो क्या 'चे' की चर्चा न करें? उसने अपनी वसीयत में ऐसा लिखा था क्या ? "Those who don't want to see India on motorcycle should stay away from discussing him." I don't want to see India on motorcycle but I discuss about him a lot ! In my view his persona was much more bigger than just a motorcycle... It was not the motorcycle which changed a 'to be a doctor' into a revolutionary. It was the travels and the things he saw while travelling ! और प्रतिभाजी आपने सही कहा है ऐसे लोग मरते कहाँ है उन्हें मारने वालों के देश से ही मैं चे की टी शर्ट ले के आया ! @Girijesh and Abhishek ---What i mean is spirit of 'extensive travelling'far and wide . Unless ppl. travel and see their country with own eyes how can they understand it ? Motorcycle is only an extension of one's desire to explore , it can be a bi-cycle also . Then there are places where no vehicle can reach so one has to be on foot only. Motorcycle is a metaphor for the seeker , for the lover of nature and its people. Most of the people discussing Che' can't run half a mile at a stretch and they claim to 'inspired' . ! हमारा भी इस "चे" को सलाम! 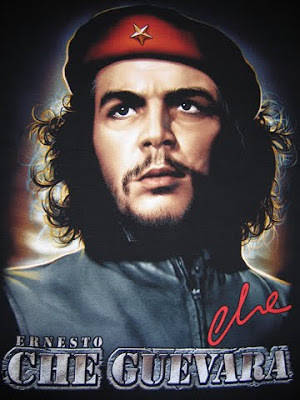 Che is the sign of different charr]acteristics. movement on bike is not the matter of criticism. this activity shows freedom from care which is the characteristic of Che.